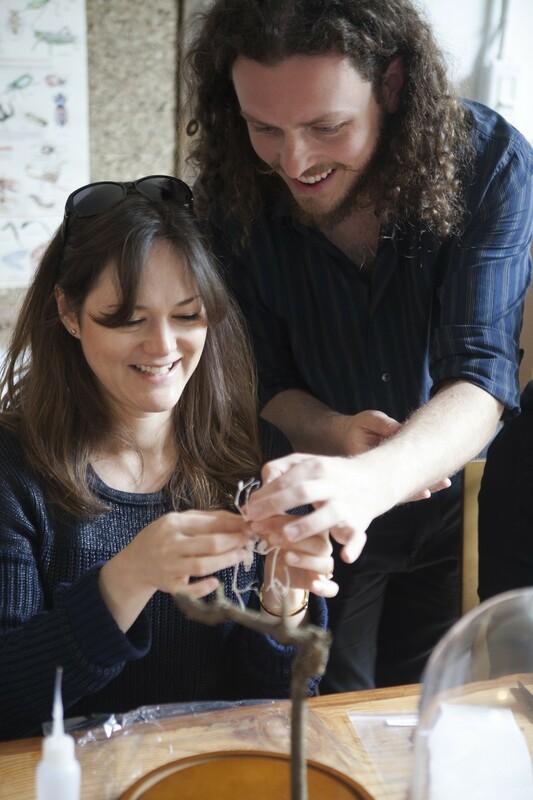 When I walked into local oddities shop Paxton Gate for a Bat Skeleton Workshop last month, I didn't quite know what to expect. After all, I'd never worked with bat bones before. 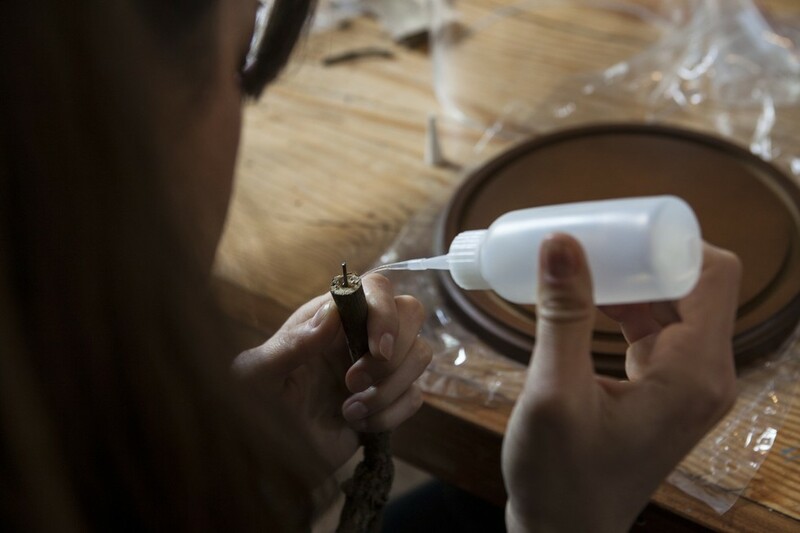 Turns out, this is the most fun DIY class in the city, and your apartment will cooler for it. 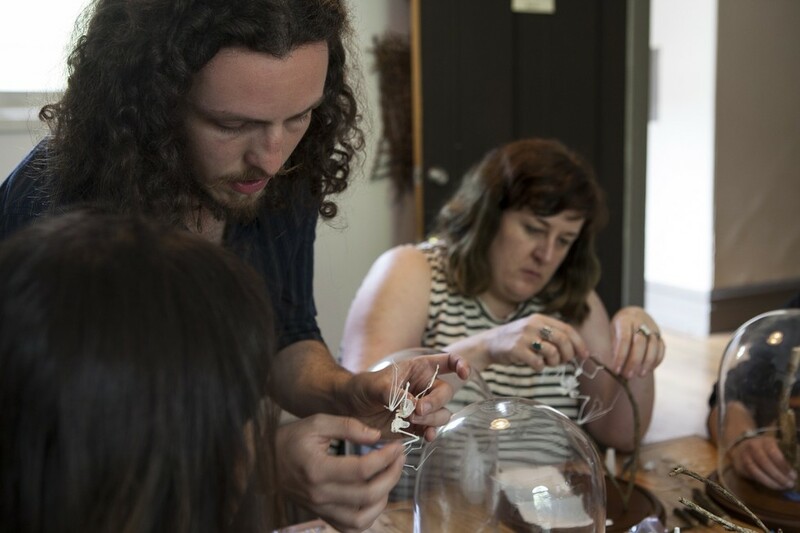 The class is led by Wilder Duncan, who is pretty famous is the world of taxidermy. Based in Brooklyn, Duncan worked for several years at The Evolution Store (an East Coast version of Paxton Gate) creating, repairing, and restoring objects of natural historical interest such as fossils, seashells, minerals, insects and articulated skeletons—both animal and human. 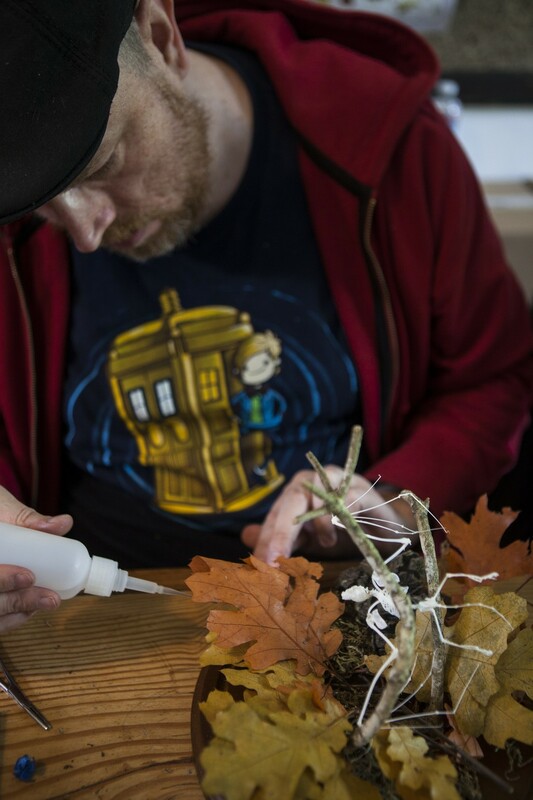 And while it's easy to be a little creeped out while you slowly maneuver the bones of a dead animal, Duncan kept the mood light, cracking jokes, encouraging people to not be afraid to play with the skeleton—because "broken bones can be repaired with super glue"—and to have fun with it. 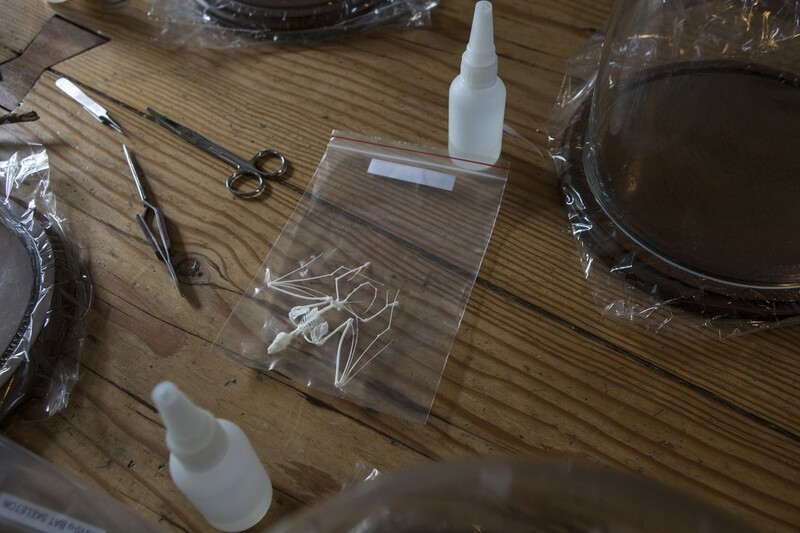 To begin, eleven participants sat down at a long wooden table full of glass domes, branches, scissors, and glue—all the tools needed for a DIY osteological preparation. 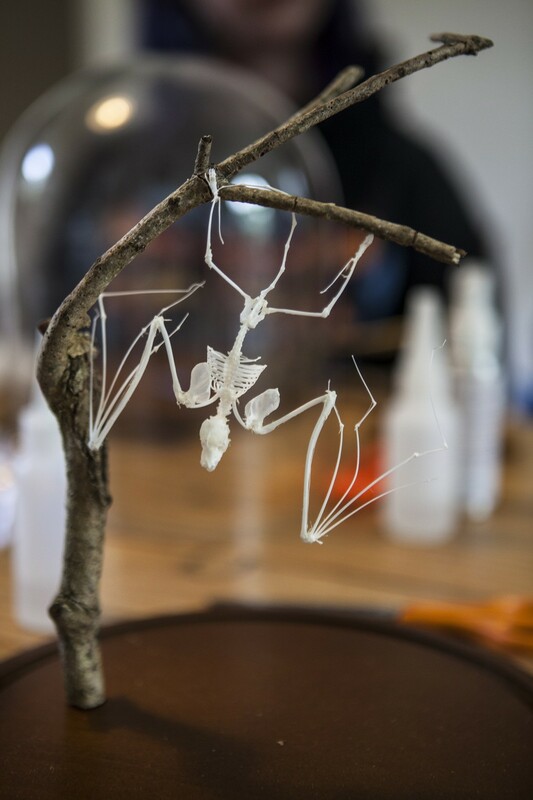 The finished product, a "lifelike" bat skeleton posed in a glass dome, is modeled after the creepy-cool zoological displays of the 19th century. 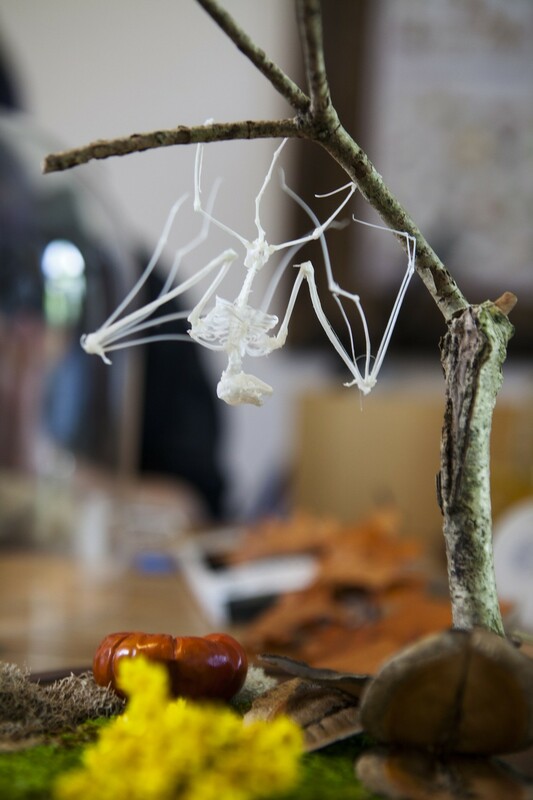 For three hours, we did our best to create a natural environment and a new home for our little bat skeletons, while Duncan was moving around, helping students and teaching the ancient methods of specimen preparation that link science with art. "We are making a piece of art here using all the natural elements available" he reminded us. 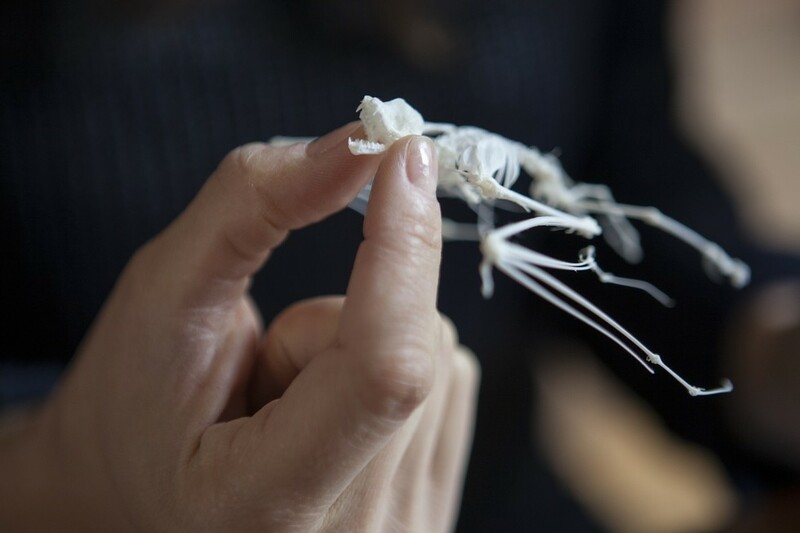 Unlike me, most of the participants already knew their way around a bat skeleton, their fingers expertly molding and manipulating the Pipistrellus abramus (the scientific name of this bat species, which comes from China). 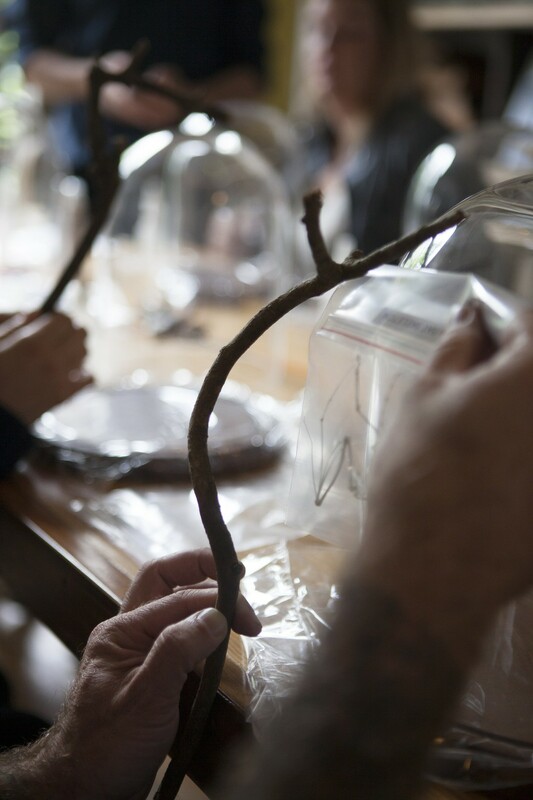 They're all collectors and passionate about everything related to dead insects and animals. "I love bat skeletons and I have a huge collection at my house," said Nicky Selken, one of the eleven participants at the small workshop. "I tried to take this class in New York but it was cancelled, and when I read that Wilder Duncan was here to lead this workshop I enrolled right away." "I have a bunch of these composition in my house," said Josh, another participant who was offering chocolate to the table. 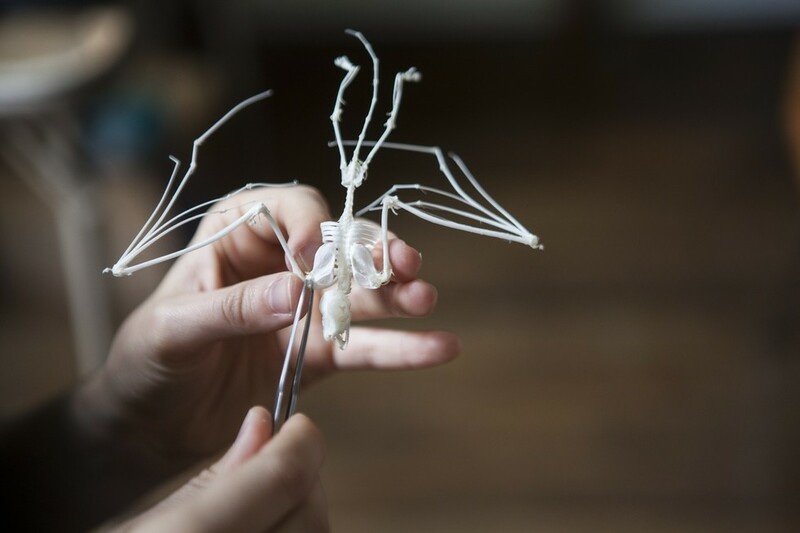 "I think it is fun to see what you can create with bat skeletons and it is very interesting to learn about their anatomy." 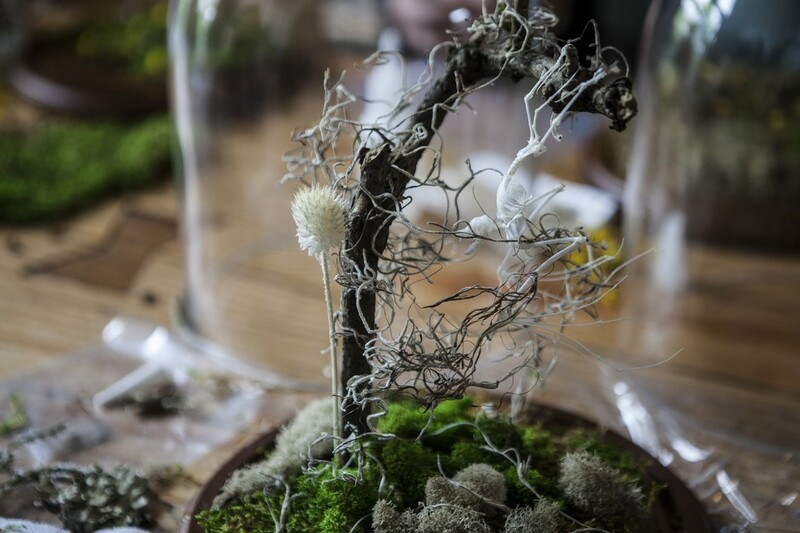 Some of the students brought their own accessories to personalize their compositions, while others rummaged through the provided boxes of flowers, moss, leaves and all kind of embellishments to create the perfect home for their pipistrelles. 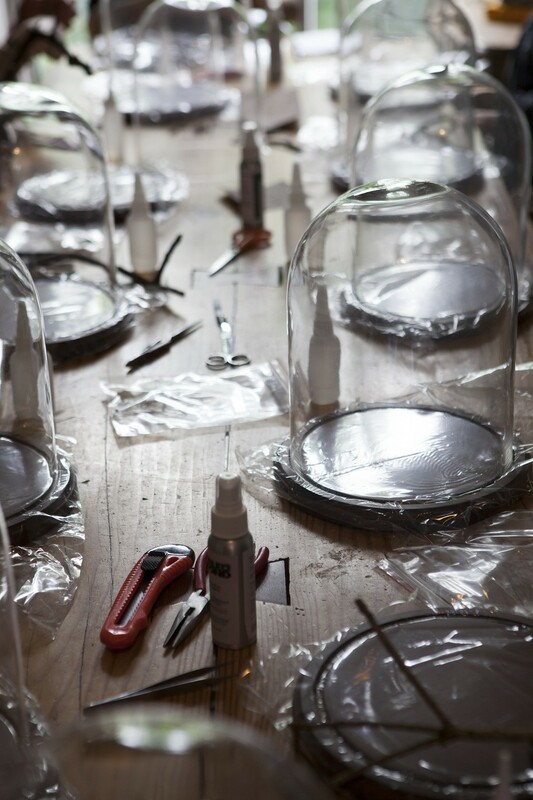 At the end of the class, the finished domes varied from minimal-chic to bold and elaborate, but either way, everyone's apartment is now way more badass. 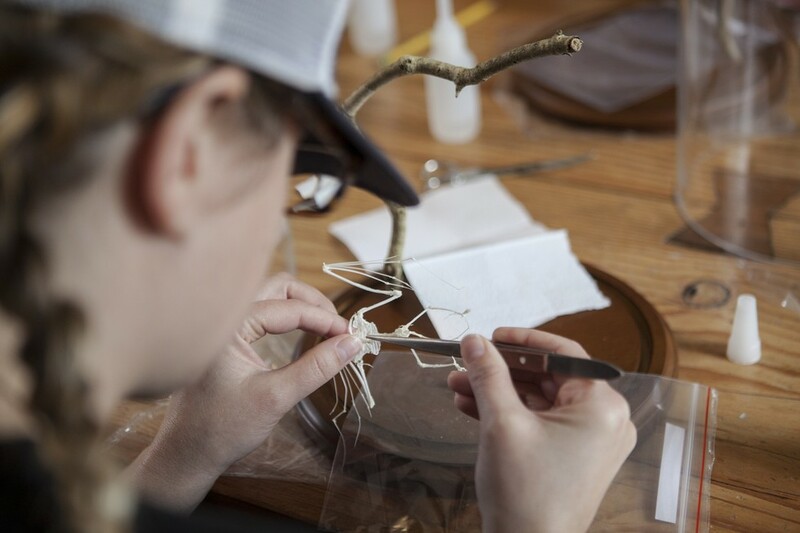 A participant puts glue on the branch to start the process. Glue, scissors, and all the tools to start working. Choosing which branch to hang the bat skeleton from. The final product will "live" inside a glass dome. A participant attempts to align the bones. Wilder shows a participant how to open the mouth of the bat skeleton. A participant working on his composition. The bones are very fragile, all the participants need to be very careful when opening the wings. 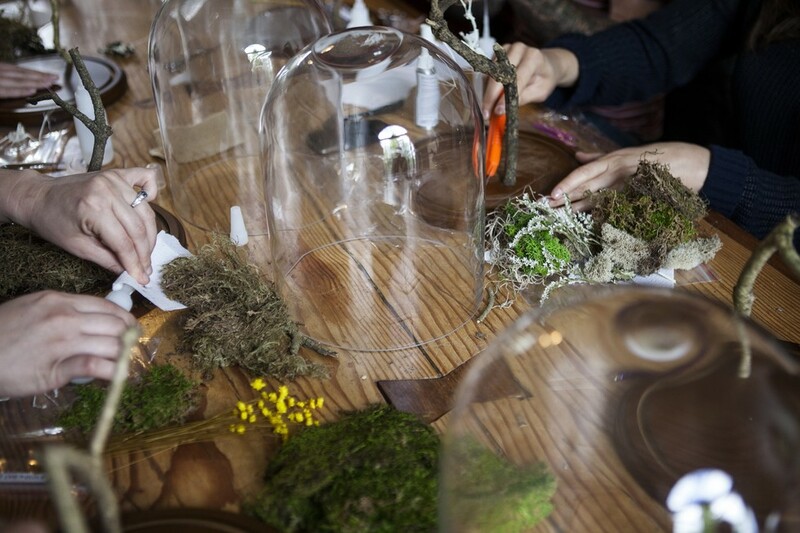 Flowers, grass and moss to decorate the glass dome. The best spot for the bat skeleton to fly.